our perfectly imperfect life: Sliver Anyone? YIKES! More information, please . . . are they splinters or cuts???? Ouch, ouch, and ouch! What happened? Holy crap!!! What in the world happened?!?!? Hugging cactus? Oh my goodnes....poor kid! 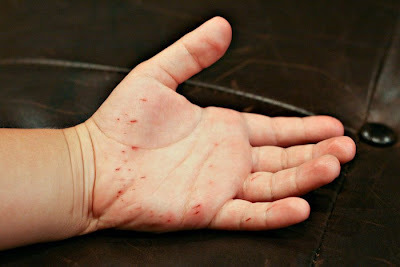 My 6 year old totally over dramatizes (is that even a word) one teeny tiny little splinter that is hardly even a splinter, I couldn't imagine the melt-down he'd have over all of those! What happened?? !